Source for this information is from the book “Under Angel Wings- The Autobiography of Sister Maria Antonia”, Tan Books, 2000, Edited by Fr. 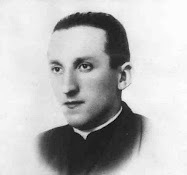 J. Batista Reus, S.J. 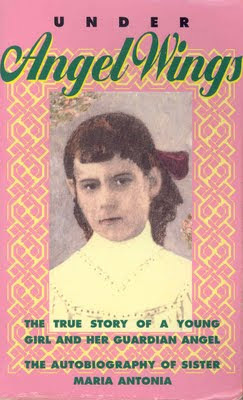 Under Angel Wings is the true story of a Brazilian girl named Cecy Cony (later Sr. Maria Antonia), who was born in 1900 and was led to high sanc­tity under the continual guidance, protection and inspiration of her Guardian Angel, whom she called her "New Friend." 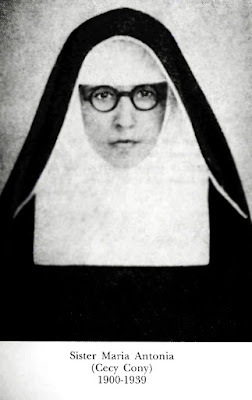 The autobiography of Sister Maria Antonia was first published in 1949 by the Franciscan Press of Petropolis, Brazil. This book became so popular that the first edition was soon exhausted, and a second edition was issued in 1950. Because of the extraordinary popularity of the book, numerous editions were again printed during the 1950's, and translated into various languages. including the current one from Tan Publishers in 2000. 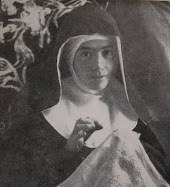 “Obliged by obedience, Sister Maria Antonia wrote the recollections of her life with a certain repugnance, and after asking the special help of Our Lord. As she finished each of the six notebooks of which the autobiography consists, she handed them in to her religious supe­riors, and did not ask anything further about them…” It was only after she died that the notebooks were published. 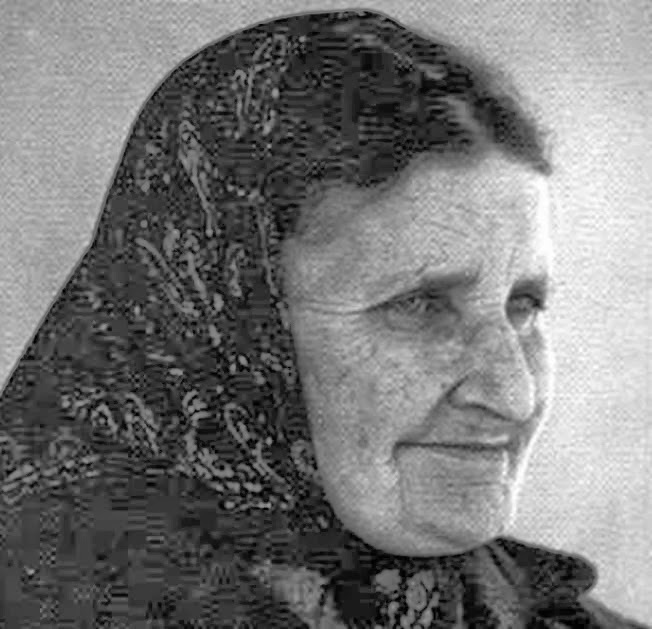 Sister Maria Antonia saw her Guardian Angel throughout most of her life, however there is a period beginning in 1935 where God permitted that she no longer see her “New Friend”, perhaps because God was leading her, and drawing her ever closer to Himself through the “night of the spirit”, which is often experienced by mystics and those having reached the higher realms of spirituality. In the year 1905 the time for the carnival approached. At that season my mother would deck us out in fancy dress. Then, accompanied by Acacia and Coriceicao, my sisters and I would go with the other little ones to the town square. I had a great dread of those who disguised themselves in those horrible masks. 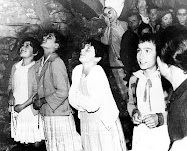 I thought the masks were their real faces, and I believed that those persons were supernatural beings who lived in the depths of the earth, surrounded by fire, in that place about which Dona Mimosa had spoken. I believe that this was the first year that I accompanied my sisters. All the confusion and noise of the square frightened me. The multi­tude of masked people, big and small, jumping around and beating the ground with those big balloons tied at the end of a stick-all this filled me with such terror that I might have died if the good God had not come to my aid. I was with the other children, who were enjoying themselves; but Acacia [her caregiver –editor] and Conceicao, con­versing with other servants, were not paying any attention to me. Thus, filled with terror and with no one to comfort me, I conceived the idea of getting away from there and returning home. I did not know the way, but I resolved to leave by the big gate. This was all I knew. I did not think of anything else. I left the group of children, and immediately I was swallowed up in that small square, which to me was like a world with­out end. I did not cry. My great fear had frozen my tears. 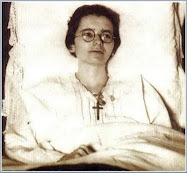 In my terror I remembered the good Jesus [a crucifix in her home which she was devoted to], whom I had left behind alone, and I felt a great sorrow for not having brought Him with me. But I knew that my Father in Heaven sees and knows everything, and that He certainly saw me there alone. Just then a big man, wearing a hor­rible mask and with flashing eyes that I can still see in my imagination, approached me and took me by the hand. At that moment I could have died of fright. I had walked a few steps, held prisoner in his big hand, when I sensed, at my side, with­out actually seeing anything-knew to be pres­ent just as truly as I knew the presence of the big masked man on my other side-the Angel whom I had seen in the picture at the home of Captain Bezerra. My Father in Heaven had sent this angel to stay with me and take me home. I was aware of his presence without see­ing him, but it was as if I had seen him. I had the absolute certainty that he was at my side, on the side opposite the masked man. Then the masked man freed me with a push and I did not see him anymore. He disappeared into the crowd. All my terror now left me, and my soul was filled with a sweet tranquillity because of the confidence I felt in my "New Friend." I had come in sight of the gate leading out of the square when I saw Acacia running toward me. If I had seen her before the arrival of my "New Friend," I should certainly have run toward her with the same anxiety with which she was has­tening toward me. But my calmness no doubt quieted Acacia's anxiety; and neither she, nor my father, nor my mother, ever knew of this incident of the Angel, for this is the first time that I have related it. From that day in February or March of 1905 my "New Friend" accompanied me always and everywhere. 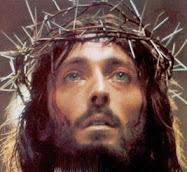 He stood guard with me at the foot of the big bureau as we watched before the Crucified Jesus. From that time I had no more fear of the semi-darkness of that room, for I felt the sweet, protecting presence of my "New Friend." That is the name I gave him and called him by until I was six years old, when I learned that he was my holy Guardian Angel. I under­stood him perfectly when he spoke to me, although I never heard his holy voice. Soon after the carnival I heard my father say­ing one day that we were going to take our vacation at the sea. 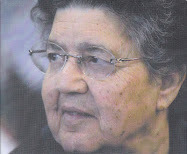 On the following day I saw Acacia, Conceicao and my mother busily prepar­ing clothes and packages. We were going to the sea! This thought delighted me. My New Friend would go also. This I knew. Every member of the household was going, even the good Abelino, the soldier who bathed Congo. Abelino would drive the carriage. However, my father could not go. During our absence he would have to live in the barracks, as our house would be closed up. I was thinking about all this while I was arranging, in a little basket that Dona Mimosa had given me, the teddy bear and also the big doll, which could get into the basket only by sitting down. Suddenly my great joy was changed into bit­ter sorrow as I remembered Someone. Even the little teddy bear would go; only my beloved Cru­cified Jesus would remain alone. He who had sent my New Friend to protect me from the masked man, He would have to remain in the dark, closed-up room. I would willingly have remained with Him, but I knew very well that my mother would not allow this. Ah, but-then the thought came to me-supposing, in place of the doll and the teddy bear, I should take along the crucifix. Acacia had given me the lit­tle basket for the doll and the teddy bear, but instead I would take the crucifix without my mother or Acacia knowing anything about it. I went to the bedroom. Having placed the high chair near the bureau, I was able to reach my Great Friend and place Him in my lap. Then, going to the wardrobe, I took out a small cape and wrapped up that crucifix which I liked so much. It was thus that the crucifix went also to the sea. During the journey I kept the bas­ket with me all the time. When we arrived at the sea, I guarded it at the foot of my little bed. We stayed many days at the seaside, but the crucifix remained always in the little bas­ket. I brought it back to the city and placed it on top of the bureau without my mother or Acacia knowing. One afternoon some other children and my sisters and I went for a walk in the country with Acacia and Conceicao. Acacia took money with her to buy fruit, and we carried little baskets. We went to a farm that was recommended by Abelino, the good soldier whom my father had brought with him from Santa Vitaria. Abelino conducted us to the farm. "Why cannot I pick some peaches like the other children?" I stretched out my hand to pick a peach, and my fingers had already touched this big velvety peach, when I received the most sweet, calm warning of my New Friend. My arm, suspended in mid-air, was gently lowered by an "invisible hand," which I felt as really as if I had been touched by one of the persons I could see. 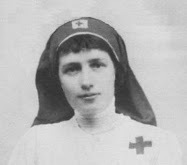 For I had a better and more clear under­standing of the voice of my New Friend than of the spoken words of Mother Raphael, or Sis­ter Pauline, or Sister Irene, whom I could see when they spoke to me. 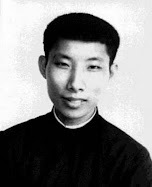 In one of her instructions Sister Irene had spoken to us about a young boy who died and was sentenced to suffer in Purgatory because of the lies he had told during life. Up to that time I had not known the meaning of a lie, and I imagined that the poor boy had committed a very big sin to deserve such a punishment. How­ever, my New Friend would give me the expla­nation very soon. Each afternoon I was accustomed to go with Acacia and the neighborhood children to buy milk. Each child brought along a little glass wrapped in a napkin. I had a very pretty green glass decorated with a golden wing and spotted with little stars. It was Captain Barcelos [a family friend] who had given it to me. "What a beautiful way to act, my little angry puppy! Now you can do without a glass and without milk. While the others drink milk, you can watch them!" Everything happened so quickly that it was all over before I realized what had happened. But then I became so angry and revengeful that I was just about to run after my companion in order to break her glass, when my New Friend entered into action, holding me back in the same manner as when he hindered me from stealing the fruit. And I heard clearly the warn­ing of my New Friend: "Your poor companion has committed two big sins." The first, which referred to the breaking of the glass, I did not at that time understand. But the second-ah, I suddenly understood that the second sin was the lie told to Acacia, the same kind of sin for which the young boy was punished. Yes, my com­panion had lied to Acacia, who thought that everything had happened as it was told to her. Now I understood perfectly the meaning of a lie. I said to my New Friend: "Now I know. 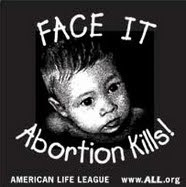 It would be a lie if I were to break a glass and afterward tell my mother I did not do it." We finally arrived at the place where we were accustomed to buy the milk, and I forgot to tell Acacia that it was not I who had broken the glass. Perhaps it was because my New Friend was with me and I respected his presence even more than I respected the presence of Mother Raphael, Sister Irene and Sister Pauline, the authority of these being supreme in my eyes. Acacia, however, always allowed me to have what I wanted; so she gave me milk from my sister's glass. Thus it was that my New Friend hindered me from committing the ugly and low sin of vengeance. Oh my holy Guardian Angel, if I were to tell all that you have done for me, a big book would not contain the account of all your holy inspirations. If my New Friend had not filled me with the greatest respect for his holy presence, I think that I should have acquired at an early age care­less habits, more or less immodest. I realized perfectly well, when I was in the presence of the Sisters or of other persons for whom I had great respect, that I should be careful of the postures I assumed. But I learned to be even more careful when I was alone, for then I felt myself being observed by my New Friend Until I was eight years of age it was Acacia who dressed and bathed me, combed my hair, put me to bed and called me in the morning. I had learned to rely on her too much; so it was not until I was ten or eleven that I dis­pensed completely with her services in this regard. Oftentimes, on getting up in the morn­ing and dressing myself-for example, putting on my stockings-I was not careful of my posi­tion or of my dress. At such times I immedi­ately felt the holy presence of my Guardian Angel so vividly, without ever seeing him, and I so strongly felt his reproval of my improper posture, that, being thoroughly ashamed, I would close my eyes lest I see his holy face regarding me sternly. This scene was repeated innumerable times, sometimes when I was alone, other times when I was in the midst of the most interesting games. Through the grace of the good God I do not remember ever resisting these holy warnings of my New Friend, even though oftentimes I had to subdue my rebellious nature, filled with bad inclinations as it was. My New Friend did not want me to continue any farther. I felt his holy arm taking me gen­tly from the pony, just as I had previously felt the lieutenant lifting me onto the pony's back. When I reached the ground, I said to the lieu­tenant: "I do not wish to ride any more." The lieutenant admired my seeming agility in dis­mounting from the pony, and he related the fact to my father, who called me cowardly and silly. I should have liked to ride on the pony, but I wanted much more to please my New Friend. The great day of my First Holy Communion, October 17, approached very slowly. Before this great event, we made our second Confession. Finally the eve of the holy day arrived. Sister Irene took good care of us. 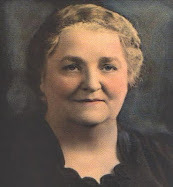 When I returned home, I remained seated in the little rocking chair at the foot of the bureau, preparing the prayers which we should recite in common before and after the visit of Our Lord, as Sis­ter Irene had told us. I did not yet know how to read quickly, and I was accustomed to point out each word with my finger. 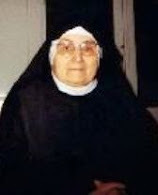 Sister Irene did not want us to read our prayers, but I wanted to say them perfectly without mispronouncing one word, so that Our Lord could hear and understand me…. …Finally, the seventeenth of October arrived. For me this was a holy date, a date of infinite happiness, a date on which I came to know at first hand-or rather when I welcomed within myself--the good Jesus, the Lord of Heaven, whom a few months before I had known only from the big picture in my mother's bedroom and from the beloved crucifix on the big bureau. My good Jesus, as I look back, what holy longing fills my soul as I think of how infinitely happy I was on the day of my First Communion! That was the first time, oh my God, that I felt really and vividly within myself Thy most holy presence, Thy Real Pres­ence. It was indeed well that I waited for Thee, oh my Jesus, and I was not deceived. I knew that I would feel Thee in me, not as I perceived and felt the presence of my New Friend, but as if Thou, oh my God, were I myself, and as if I myself were Thou. You in me and I in Thee. Thy soul in my soul, Thy heart in my heart! Two souls in only one soul! Two hearts in only one heart! The great omnipo­tent God and His miserable little creature! I do not know how to describe how much I loved Thee at that moment, and how much You, oh great God, have loved me. Only we two, Jesus and His little "Cece," can know this. Oh good and most faithful Jesus, thirty long years have passed since then, and still we love each other very much; infinitely more today, is it not so, oh my God? From that day I felt always, always, Thy most holy presence in me, until the past year, when Thou did leave Thy little ser­vant immersed in the most sorrowful abandonment, in the most sorrowful longing. However, may Thy most holy will be fulfilled in Thy little creature! It is true that even in the novitiate You hid Yourself from me at times, but soon, very soon, I did find Thee. 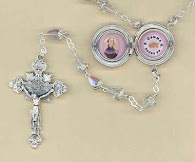 On that sacred day of my First Communion, October 17, 1906, after I had returned home, accompanied not only by my New Friend, but bearing within me my Divine Guest, I desired most ardently to lock myself in my little room and there to remain alone with my God. 1 had so many things to say to Him, so many favors to ask from Him. I desired to clasp Him to my heart, to protest my love to Him, to make Him innumerable promises. But alas! Acacia was there waiting for me, ready to take me to the house of my grandmother and my godmother. I went with her, but very soon returned home. When Acacia had taken off my white dress and the veil with its wreath of flowers, I asked her to let me wear one of my Sunday dresses, because I was thinking of the Great Visitor I was entertaining. Dressed once more, I ran to my room and sat in my little chair quietly, seriously, respect­fully, using my best manners; and I began to make acts of love-many acts of love-to my God. I embraced myself, because in me I embraced Jesus. A thousand promises of love and fidelity I made to Him in my childish lan­guage, and I knew that Jesus understood me very well-much better than my father or mother. I felt so vividly within me the presence of my God, though in a manner much different from the way I perceived my New Friend. It was as if I myself were the good Jesus-He, my Divine Guest, listened to me without being bored. And I, without hearing His holy voice, listened atten­tively and lovingly to what Jesus wished from His little servant: that I never, never commit even one sin, so that He, Jesus, might never be separated from me-not even once, not even for one moment! Then getting up from the chair, I knelt down and made a little cross with my two index fin­gers. This I kissed in my childish simplicity and said with the most firm resolution: "Oh good and beloved Jesus, I swear to Thee, my Lord, that I do not want ever to commit any sin." This was the first and only oath that I ever took in the world. Perhaps I did not understand the immense obligation that I assumed. I cannot say, but I do know this much: I made this oath moved by a great desire never to offend the good God. Until today I kept this oath as a secret in my heart. I never revealed it to any­one. I took this oath while Jesus was within me and my New Friend was at my side. And this is the moment when I reveal my secret. Jesus, the good Jesus, accepted and guarded in His most Sacred Heart this oath of a weak crea­ture; and through His grace He took care that this oath was never broken, even to this date. The source for this information is the wonderful Autobiography “Under Angel Wings”. See link at the top of this article on how to obtain it. Later in the narrative, we read how her Guardian Angel would spread forth his wings and shield her from viewing the bathers at the beach, and also certain movies at the movie theater, always keeping a close watch over her modesty and purity. 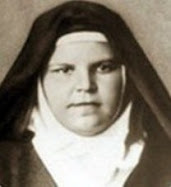 Sister Maria Antonia died a holy death on the night of April 24, 1939, at age 40. 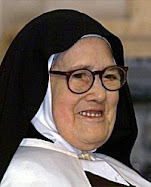 ~Sister Maria Antonia, pray for us! There is a story in this book of how little Cecy Cony helped this very old man named Cyprian who lived in a poor house for sick people not far from her home. When she was only 10 years old, she would bring him food everyday and would speak to him of God. 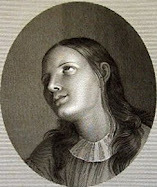 She eventiually learned from him that he was never baptised, so in her childlike innocence she decided that she would baptise him herself, since he was completely bedridden and could not go to the Church. 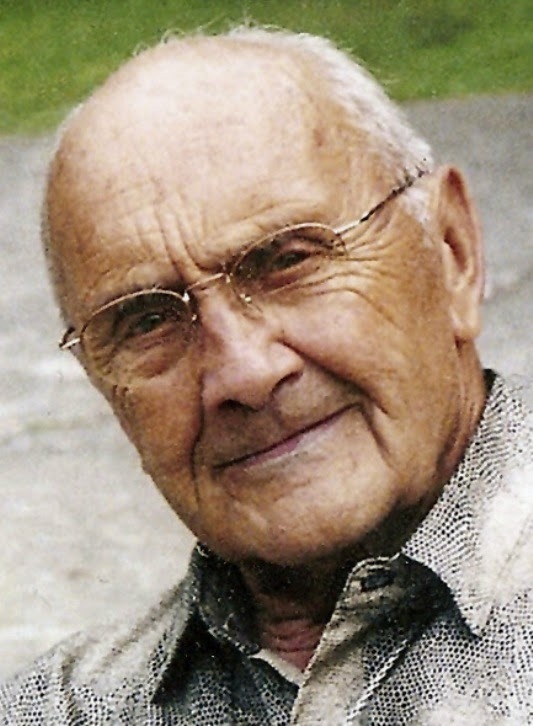 The simple poor old man was totally overcome with joy at the prospect of becoming a child of God through his "baptism"....he could do nothing but cry tears of joy each day as the day of his baptism neared. 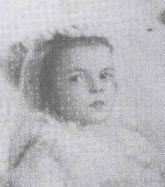 Little Cecy Cony taught him the catechism herself and set his "baptism" for a particular Sunday. Without giving away to much of the story, the old man was "baptised" by little Cecy, and was absolutely overcome with happiness and spiritual joy. And God awaited his "baptism" and then took him to Himself later that very same day. Cecy learned of his holy death the next day...she writes about how she missed him, but she knew that he was now with God. 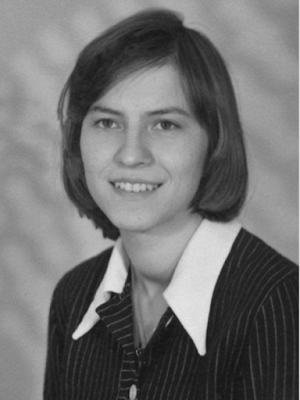 When she grew older and became a Nun, she then realized how "uncoventional" this baptism was...but, it seems that she knew that God approved of it because of her childlike innocence at age 10 and because of her charity and holy desire to do a great spiritual deed to her neighbor. Anyway, "Cyprian's baptism" is just one of the many excellent little stories in this inspirational book. Someone gave me this book to give to my children to read, and I read it first. I was in tears most of the time. Now it is required reading in our homeschool. This story is so remarkable and edifying, as well as easy to read. You will never regret reading this book! Thanks for your comments...I too absolutely love this book. I bought several copies for my kids and even gave one to a friend. It is written so simply and plainly, yet it is so inspirational. And the lessons that the Angel taught her are very informative. him at every moment of my life here on Earth. of God in His Angels and in His Saints! Amen. I loved reading this excerpt, except that I am confused about this particular statement. 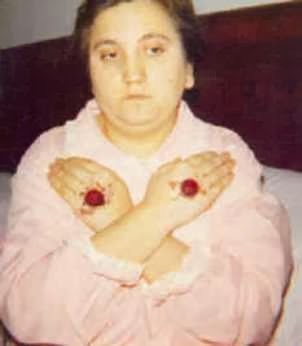 "Since God had chosen Cecy for intimate union with Him­self during her earthly life, her Guardian Angel was charged with the duty of preserving her from the danger of even the slightest fault against modesty." How is riding a pony a fault against her modesty?? I am a roman catholic but I still find it hard to grasp the concept of divine spouse and the intimate union many female mystics experience and speak of. You inquire how Cecy would violate modesty by riding a pony. If she was not riding side saddle and was riding a dress, that could have endangered her modesty. Getting onto or off of the pony could cause her dress to rise above the point of modesty and that is why the angel asked her to stop riding. 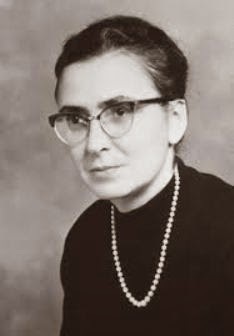 Also, the concept of divine spouse and intimate union experienced by many female mystics is one of the most beautiful experiences of their lives. Their union with the Lord was so close that He sometimes gave them a sign of their mystical espousal such as a ring like a wedding ring. He wanted them to belong to Him alone and gave them the grace to offer their lives entirely to Him as a woman would offer herself to her husband. One great example is St. Gertrude of Helfta. Her relationship with the Lord was by far the most beautiful I have read about. 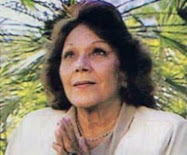 Perhaps if you read her book "The Herald of Divine Love" you would gain greater understanding.